•Select the product for which you want to edit attributes and click on the Product Attributes button. •Product usage: Defines whether this product is Enabled or Disabled for use. 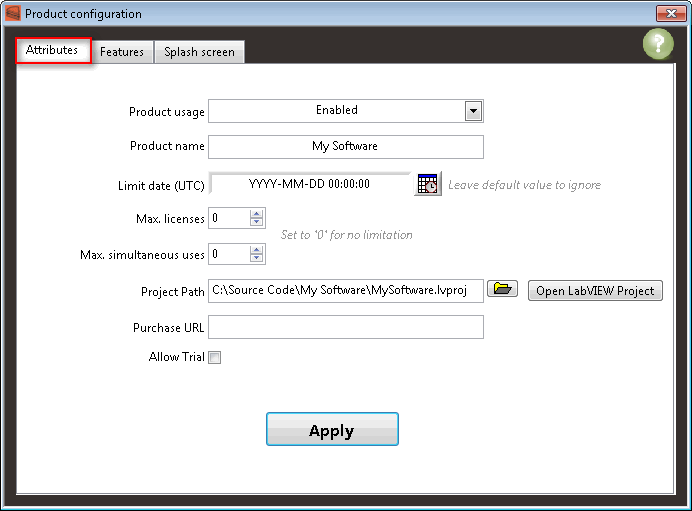 •Product name: Identification name for your product in BLT for LabVIEW. •Limit date: Date from which your product will be disabled for use. (This is the local date and time of the machine where you set the parameter. The value will be then converted in UTC format and applied independently of the end-user's location and system time settings). Either you with BLT, or your end-users with the Trial registration will be unable to register a license for this product after this number is reached. If this number is reached, any end-user starting this product will be unable to continue until someone stops using it. •Project Path: Path to the LabVIEW Project file containing your application. • Allow Trial: Check this box if you want your end-user to be able to register for a free trial license to use this product. See here how to define the default trial license settings for your product. Continue your product configuration with the Product features and the Windows customization.